A slice of nostalgia ... and deliciousness! So, just to make clear … I am not a royalist. I am not particularly interested in the upcoming wedding of William Windsor in the UK, nor am I excited to see what dress his bride will wear. But no one could escape the fluffy news pieces about the nursery tea cake that William requested as his Groomsmen Cake for the upcoming nuptials. May be we needed a break from the devastation of Japan or the multiple uprisings around the world. I’m not sure. But what I do know is this: the cake sounded intriguing. And when my beloved GoddessMoments sent out a request asking for someone to make her the cake, I thought … Ooh, Id love to do that! So I promised her a cake and I got to work doing a bit of research. 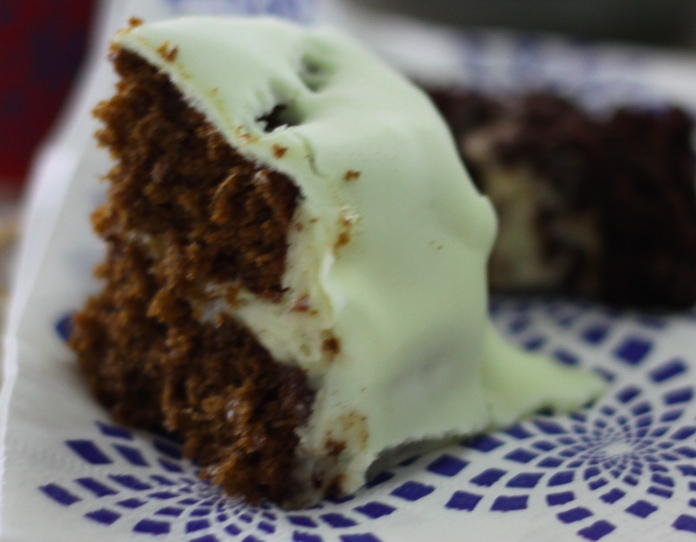 This refrigerator cake (there is no baking) was apparently a favourite tea time cake when William was a child, and according to former royal Chef Darren McGrady, is also a special favourite of the Queen. 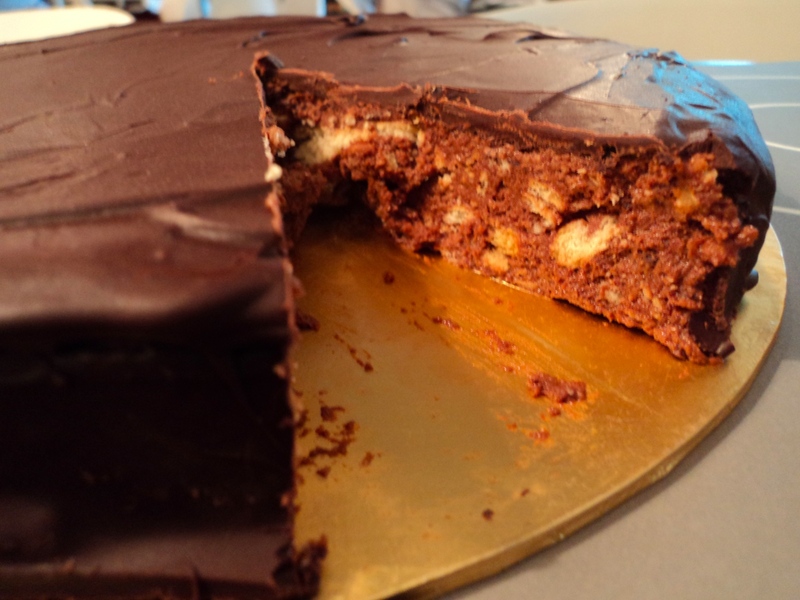 Its a simple cake – chocolate and tea biscuits are its main components, but there are several versions out there which also incorporate fruit and nuts. I have already written about my dislike for mixing the purity of chocolate with fruit and nuts – I find it muddies the waters. I found online two main recipes – one by Nigella Lawson that incorporates dried fruits and nuts and uses condensed milk as the sweetener. 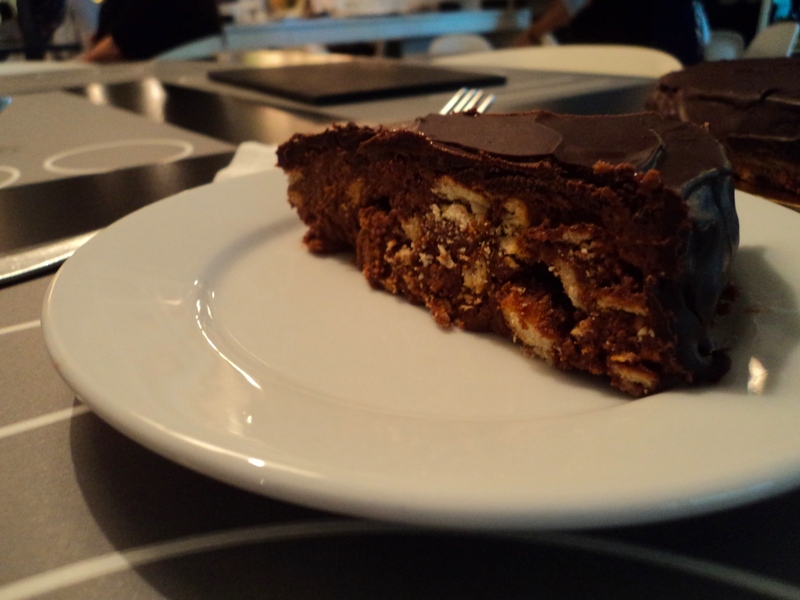 The second is attributed to Chef McGrady, and uses sugar instead, but is pure chocolate. I loved the idea of using condensed milk so I did a bit of a mashup and evolved my own recipe. I think its delicious – simple and satisfying, tasting of tea biscuits and chocolate. Please do use an organic egg in this recipe – because even though the heat of the chocolate “cooks” the egg, its probably not fully cooked. Use a pasturised egg, or omit entirely if you are worried. Add dried fruits and nuts if its your thing … and give it time to firm up in the fridge before gilding with its final bath of pure chocolate. Makes 1 9-inch cake. Please keep refrigerated. Prepare a 9 inch cake tin (if you have a spring form pan it is best, but not absolutely necessary) by lining it with parchment paper and buttering well. Set aside. In a large bowl, crush the Rich Tea Biscuits with your fingers. You want an interesting mix of almond sized pieces and crumbles. Set aside. In a stand mix, whip the butter until it is light and fluffy, and then whisk in the sweetened condensed milk until fully incorporated. Beat in the vanilla until just combined. Set aside. Pour boiling water into a saucepan, and set a small metal bowl over. Melt 6 ounces of chocolate in the small bowl, until completely liquid. Using a fork (and with the bowl still set over the hot water), whisk in an egg. 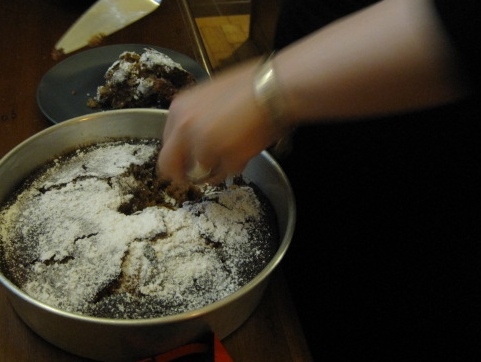 The chocolate mixture will “seize” – this is OK, just work very quickly. Pour the chocolate and egg mixture into the butter, and whisk well to combine. Pour the butter-chocolate mixture directly over the biscuits, and fold well. Pour the cake “batter” into your prepared cake tin and refrigerate, covered, for at least 3 hours or overnight. Once the cake has had time to mature in the fridge, melt the remaining 8 ounces of chocolate, and allow to cool for about ten minutes. Once the cake has solidified, use a sharp knife to loosen the edges, and turn out onto a cake rack. Set the rack over a baking sheet. Remove the parchment paper from the top of the cake and use a spatula to smooth any rough edges. Pour the melted chocolate over the cake, and smooth the sides with a spatula. Refrigerate (either on the cake rack or transfer to a serving plate) for at least another 2 – 3 hours. Serve with a very sharp knife to hack the cake to pieces! Note: You can flavour this cake with all sorts of things. Whisky comes to mind – or peppermint essence. Fruit and nuts would also work if youre so inclined. I love zucchini bread – bold in its simplicity and perfectly comforting. Its a good bread, one that is easily frozen and surprisingly easy and quick to make. I thought of this bread when I saw some luscious zucchini at O’Gourmet last week, and thought that it might be a nice idea to try a new twist. I found Bentong ginger powder at PastryPro – organic, sun-dried and so deep and complex in scent its almost overwhelming. I wanted to use it in a bread, and with my beautiful zucchini to hand, I set about inventing a new, enticing version of my beloved old standard. 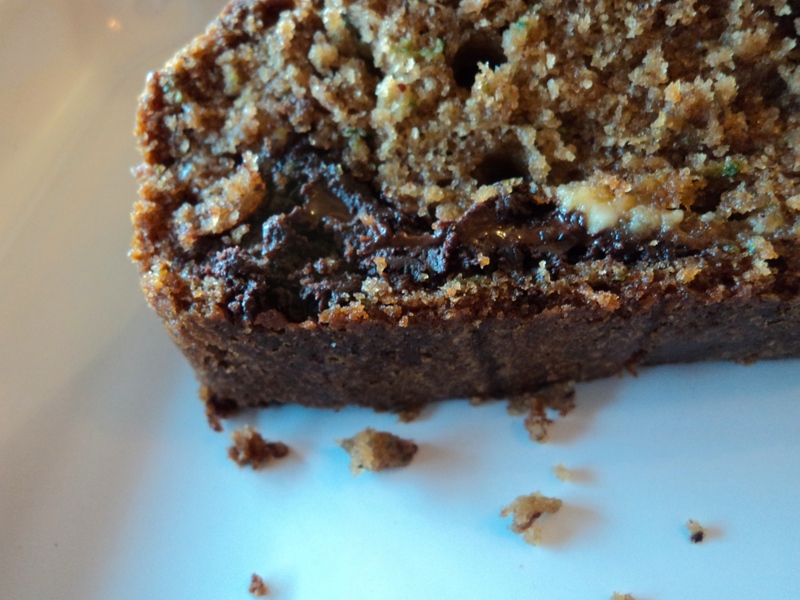 I have to admit, this new zucchini bread is pretty spectacular. It is damp, lush, complex and dark. I really decided to go all out in this bread … I used dark and light brown sugar, freshly grated nutmeg, cinnamon and the amazing Bentong ginger, a touch of ground hazelnuts, beautiful Tasmanian Leatherwood honey, and both white and bittersweet chocolate. I realise, its full on! I thought to myself, when I put the loaves in the oven … either this is going to be delicious, or its going to taste like a muddled mess! Luckily, its a wonderful, complicated, intriguing bread. Its very moist and it will get better over a few days – the flavours compounding and playing off one another. It freezes well, and its wonderful lightly toasted, as a snack, breakfast or tea time treat. Plus, what a wonderful way to get people to eat their zucchini and love it too! Preheat the oven to 175 C (350 F). Line two loaf pans with baking paper. I usually cut out a large piece of baking paper, centre the loaf pan, and cut in at a 90 degree angle on all four corners. I can then fold in the paper, and have a bit of nice overhang. Set aside the pans. Set a sieve over a small bowl, and grate the zucchini into the sieve. I use the very fine grater, but depending on the texture youre going for, you might want to grate it slightly more coarsely. Press the zucchini into the sieve to encourage as much water out as possible (you will probably get about 1 cup worth). Set aside while you prepare the rest of the ingredients (and reserve both the zucchini and its liquid!). In a large bowl, place the eggs, vegetable oil, sugars, honey and vanilla. Whisk together well until everything is well combined and integrated. Set aside. In a small bowl (or large measuring jug, which is what I use) combine the flour, ground hazelnuts, salt, baking soda, baking powder, cinnamon, ginger, and nutmeg. Stir to combine completely. Set aside for a moment. Measure out about 1/2 cup of zucchini water. Stir the flour and zucchini water into the sugar/oil mixture, in thirds, mixing gently but thoroughly. You might not use all of the zucchini water – just add a splash each time to really help the flour to integrate into the sugar/oil. Add all the zucchini and mix well, and finally add the chocolate and mix well. Divide the batter evenly between the two loaf tins. Bake, switching the tins in the oven half way through if youre concerned about hot spots, for about 45 minutes – 1 hour. A cake tester inserted into the loaf will either come up covered in chocolate (in which case, wipe down and try again!) or with scant crumbs attached. Allow the bread to cool for 10 minutes or so before devouring. This freezes exceedingly well, and will stay good in the fridge for a week or more (though its always finished up by the first day or so in my house!). So, I was thinking about the suji cake I made earlier this month. It was quite delectable, and very rustic. Nubbly bits of almonds gave it texture and a deliciously different crumb. It was the suji cake of my memory and my childhood… But there were a few things about it that annoyed. First and foremost, you really had to make this cake with forethought. No popping a few ingredients together, and quickly baking in the oven. The butter and suji had to be left for a while to get acquainted, which is fine if you have the time, but if you really want suji cake right here, right now, could be a bit frustrating. 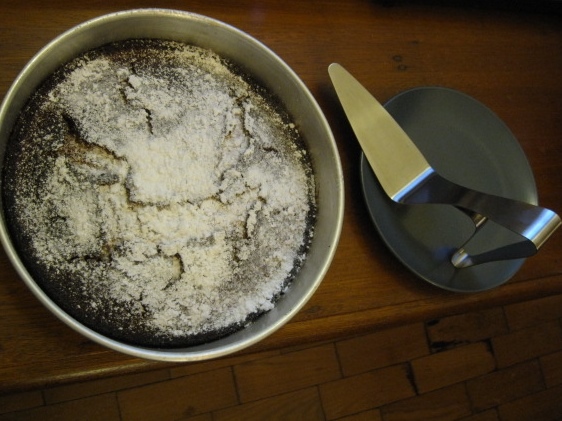 There was another suji cake of my memory that was slightly smoother, more pudding-y, with the same gorgeous scent, and since I havent been well, and have not had much to do, I decided to try and see if I could come close to making it. I succeeded quite well with this cake, and it took about 20 minutes to put together, and a further 20 – 30 minutes in a hot oven to bake. Easy and quick, this is a different suji cake, but just as comforting, just as golden, and just as open to interpretation – may be even more so. 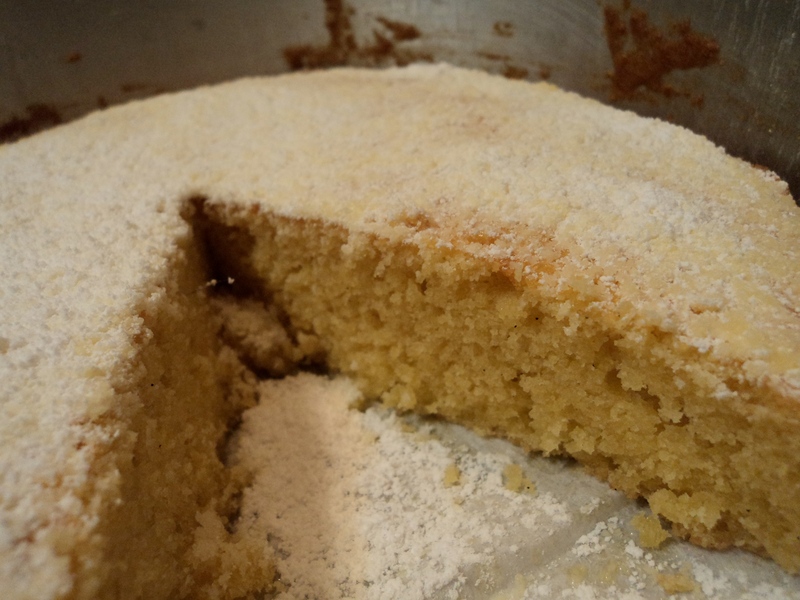 I used vanilla to scent this cake, but you could certainly go with cinnamon, some almond essence, the grated rind of an orange or lemon… Go with what comforts you, and get semolina that is as fine as possible… and yet, not floury. You want the texture and the bite of the semolina in this cake. Its a big part of what makes it so unique. If the previous cake was a bit intimidating, start with this one. Its a pleasure to make, and a joy to smell baking in the oven. Its a fantastic little cake to offer friends who are dropping by for tea. It creates happy happy memories, even when you might be struggling with a cold, or tiredness, or just the regular woes of the world. A little sifted icing sugar, or a simple glaze, or a smear of buttercream elevates this cake, but its so good it doesnt really need it. 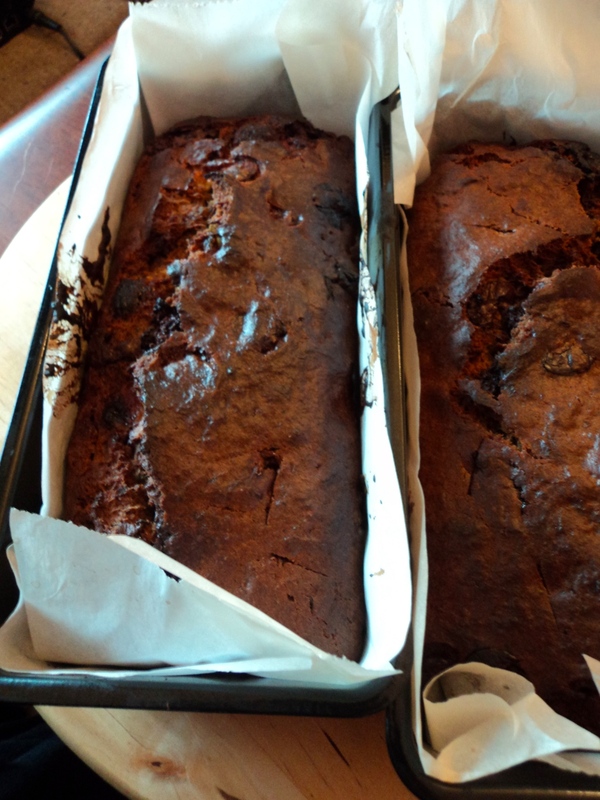 As you can tell from the photo – I was so greedy for a taste, I sliced it straight out of the pan, without waiting to sift any icing sugar on my bit. This little golden cake seems to say, for that one glorious instant, its OK. Just have some cake, and be happy. Preheat your oven to 175C (350F). Butter a 9-inch cake tin, and line with baking paper. Butter that too, and set the cake tin aside. In a large mixing bowl, cream the butter until soft and slightly fluffy. Add 3/4 cup icing sugar, and cream well. It will look like the beginning of buttercream. I decided to use icing sugar in this recipe because I wanted the softness of the cake to be highlighted. The fineness of the icing sugar really helped. Add the 5 egg yolks, one at a time, beating on low speed after each addition until fully incorporated, before you add the next. This cake, while quite quick and easy, also relies on a slow and gentle process of addition of each ingredient. I used a stand mixer, and as I added each egg yolk only after I separated it from its white. This gave the batter a period of slow steady incorporation of each yolk before the next was added. Once all five yolks have been added, you should have a gloriously golden batter. Add the sour cream and vanilla essence, pausing to combine after each addition. In a measuring cup, combine the salt, semolina and baking powder, and stir with a fork to combine. Add to the egg-butter-sugar mixture in a slow steady stream, beating with a stand mixer or electric beaters all the while, on medium low. Keep beating for about a minute, and then add the ground almonds in a steady stream, beating all the while. Once the mixture has been well combined, set it aside for at least ten minutes or so. Clean your beaters, and in a clean bowl, whisk the 4 egg whites until they hold firm peaks. If you turn the bowl upside down, and the egg whites stay, then they are ready – though I would not suggest you do this unless youre sure, or you have extra egg whites to work with! Once the batter has sat for the requisite time, fold in the beaten egg whites, in three batches, combining extremely well. You need to make sure the batter is fully incorporated. The egg whites will lighten the colour and texture of the mixture. You shouldnt beat them into the batter, but you dont need to be timid about mixing them in firmly with a spatula. Turn out the batter into your prepared tin, and bake for 20 – 30 minutes, or until the cake is firm to the touch, and a tester inserted into the centre comes out clean. Let cool for five minutes in the pan, and then turn out onto a cake rack, and turn right side up again. Cover with sifted icing sugar if you like. A warm slice of this cake will ease just about anything that ails you 🙂 Enjoy. We made the dough for Chicago deep dish pizza tonight, and Ezril and AngelKitten decided to stay to watch the Netherlands – Uruguay game. Though we had already had dinner, we felt like something warm, tasty and comforting for a snack. I checked what was in the cupboard, and found the ingredients for a fluffy yet sticky, warm and crusty fresh ginger cake. Oh wow, was this good. We devoured it as soon as it was out of the oven (a bit of a mistake, we should have reigned in our greed and waited five minutes!) and it warmed us with love and companionship as it fed us. This is a great tea cake – quick to put together, and so very welcoming. You could use powdered ginger instead, but I love the sharpness of fresh. Preheat your oven to 180C or 350F. Butter a 9 inch cake pan well and set aside. In a large bowl, combine flours, baking soda, salt, mixed spice, cinnamon and ginger. Whisk gentle to combine. In a saucepan, over medium to low heat, combine butter, golden syrup and brown sugar until just combined, and the butter has melted. In a small bowl or measuring cup, combine buttermilk, milk ginger beer, egg and vanilla, and beat with a fork to combine. Pour the butter mixture into the flour, and beat with a whisk to incorporate, and then beat in the buttermilk mixture. You will have a very liquid cake batter. Pour into cake tin and bake for 30 – 45 minutes, until the top has turned golden and a toothpick inserted into the centre of the cake comes out with a few crumbs attached. The cake will be fluffy at the edges and sticky gooey in the centre. A delightful combination! Sieve a few tablespoons of caster sugar over the top of the cake, and leave to cook for at least 5 minutes before slicing from the pan and enjoying. If you really want to gild the lily, this would be pretty extraordinary with some lemon curd slathered over the top instead of caster sugar. It would be great baked in loaf tins as well, and sliced. Excellent with a very old cheddar or other sharp cheese. And this is perfect summer picnic cake. Any which way, enjoy with love! Special thanks to AngelKitten again for keeping track of the cooking ingredients, and to Ezril for tasting!